Jolly Fish Press, 9781631630149, 232pp. Doyin Richards' adventures in fatherhood have been documented on his blog, Daddy Doin' Work. With this book, he answers questions about fatherhood that many women want to know in his no-nonsense, entertaining style. He urges new mothers to enter the minds of new dads, thereby changing their perception of what should be expected from a modern father. 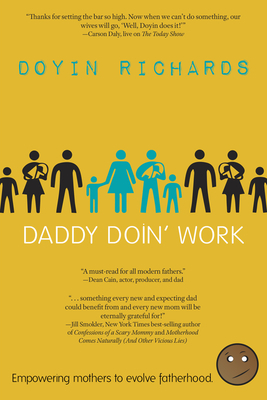 Richards exposes the manipulative secrets of deadbeat dads, offers practical tips to help hardworking dads understand that being a father encompasses more than paying the bills, and provides methods to ensure that amazing dads stay on track while inspiring more fathers to be just like them. Most importantly, women will be forced to take a long look in the mirror to determine if they are part of the solution or part of the problem in shaping the behavior of modern fathers. Doyin Richards is a father, husband, writer, Daddy Consultant, and public speaker inspiring new mothers and fathers to think, laugh, and learn while evolving as parents and couples. He is the author of the popular and well-respected parenting blog Daddy Doin' Work, is a regular contributor to the Huffington Post, and has appeared on national and international television several times. He lives in Los Angeles.